1051. “United States Census: 1930,” Bureau of the Census, US Dept. of Commerce, United States of America, 1930, TN, Robertson, Greenbrier, April 4, 1930, Mrs. Pearl E Cotton, 3A/3B, 3, 18, T626, 2270, 206, 416. 1052. 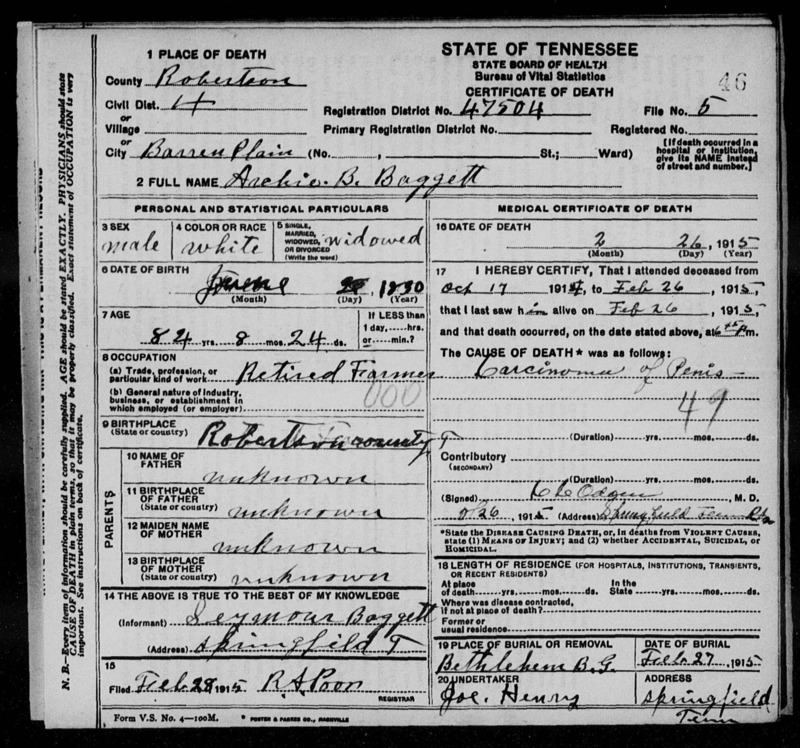 Archie B Baggett, “Tennessee Death Records, 1914-1955,” microfilm, digital folder number: 4183039-image number: 986-film number: 1299643-volume/page/certificate number: v 42 cn 46, https://familysearch.org/pal:/MM9.1.2/M17T-GQW/p1. 1053. 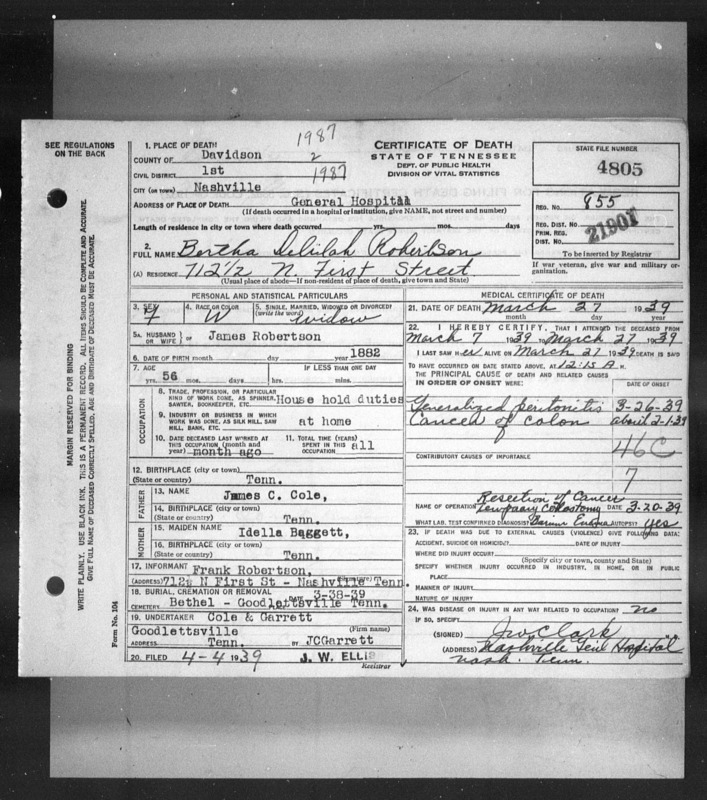 Bertha Delilah Robertson, “Tennessee Death Records, 1914-1955,” microfilm, digital folder number: 4183668-image number: 2601-film number: 1876872-volume/page/certificate number: cn 4805, https://familysearch.org/pal:/MM9.1.2/M14M-45R/p3. 1054. 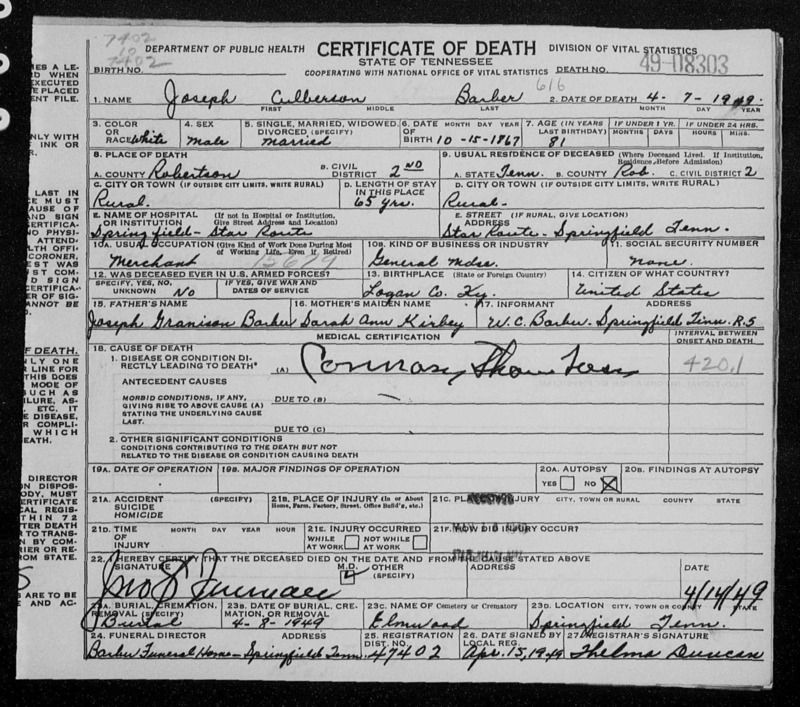 Wilson Caldwell Rust, “Tennessee Death Records, 1914-1955,” microfilm, digital folder number: 4183678-image number: 563-film number: 1876882-volume/page/certificate number: cn 27985, https://familysearch.org/pal:/MM9.1.2/M149-QBK/p1. 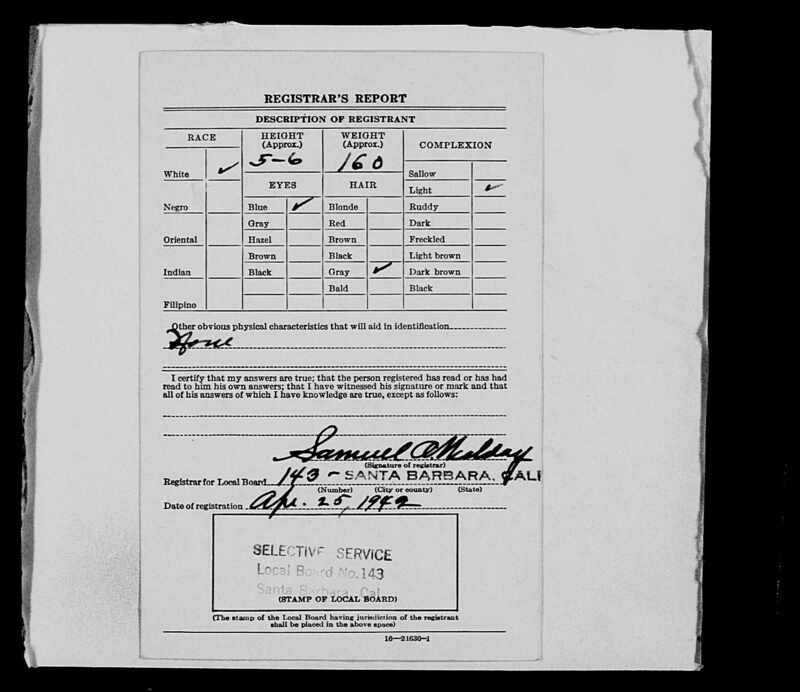 1056. emurratti1085920, 16 Sep 2004, MMS5-ZG2, https://familysearch.org/pal:/MM9.2.1/SPLL-VXC. 1057. 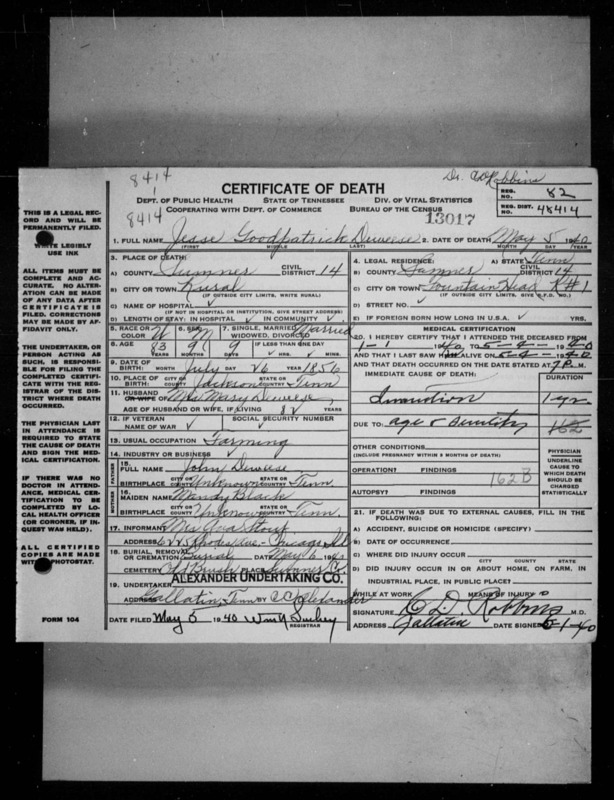 Isadora D Morton, “Tennessee Death Records, 1914-1955,” microfilm, digital folder number: 4184082-image number: 208-film number: 1299742-volume/page/certificate number: v 10 cn 201, https://familysearch.org/pal:/MM9.1.2/M1WQ-8XZ/p1. 1058. 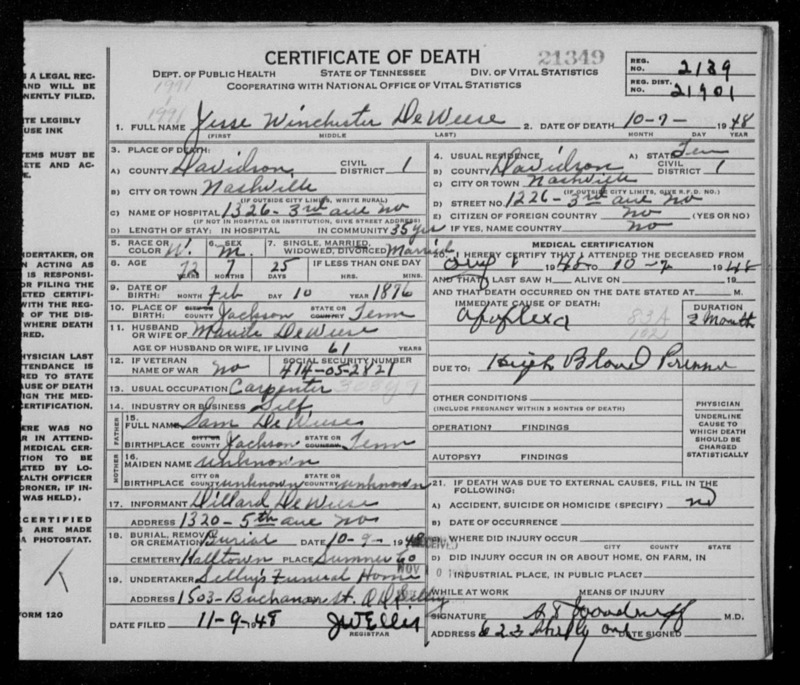 Jesse Winchester DeWeese, “Tennessee Death Records, 1914-1955,” microfilm, digital folder number: 4184937-image number: 1614-film number: 2137401-volume/page/certificate number: cn 21349, https://familysearch.org/pal:/MM9.1.2/M14C-1PN/p2. 1059. 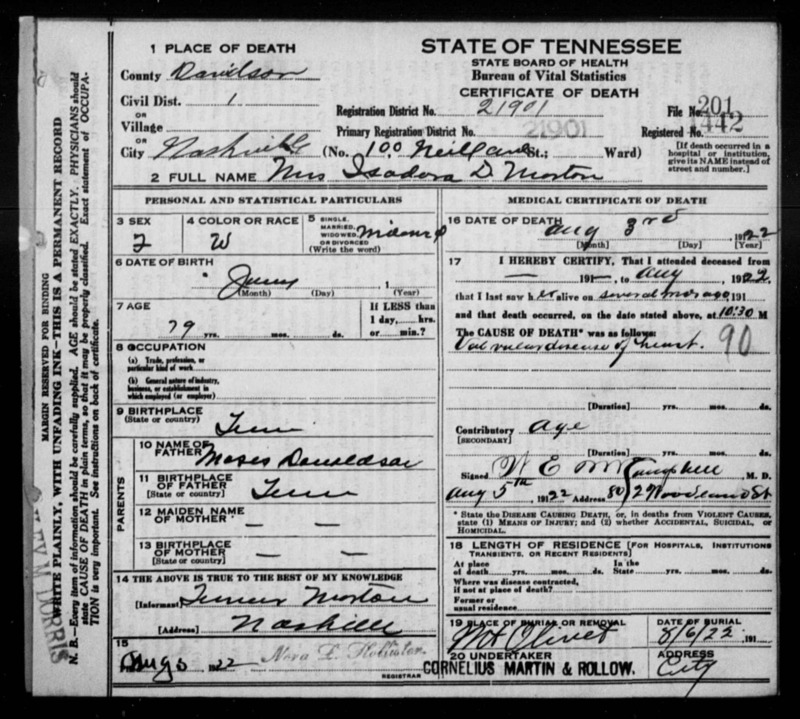 Jesse Goodpatrick DeWeese, “Tennessee Death Records, 1914-1955,” microfilm, digital folder number: 4184453-image number: 593-film number: 1876888-volume/page/certificate number: cn 13017, https://familysearch.org/pal:/MM9.1.2/M149-LV1/p1. 1060. 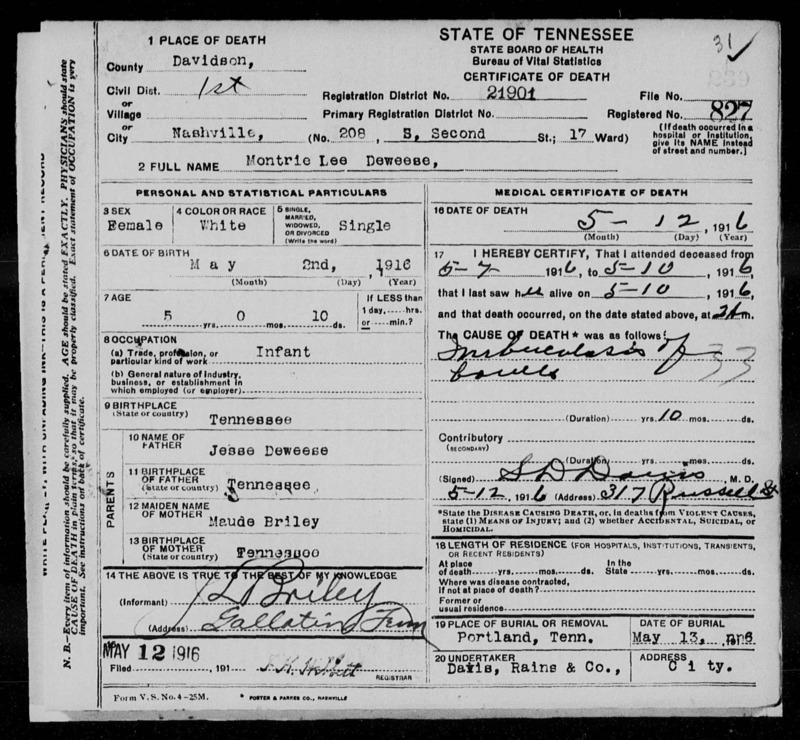 “Tennessee, Births and Christenings, 1828-1939,” Edna M Deweese, system origin: Tennessee-EASy-source film number: 467504-reference number: P 9, https://familysearch.org/pal:/MM9.1.2/M17K-QQM/p2. 1061. “United States Census: 1920,” Bureau of the Census, US Dept. of Commerce, United States of America, 1920, TN, Sumner, District 14, January 30, 1920, Grover C Freeland, 20B, 4, 129, T625, 1767, 215, 1012. 1062. 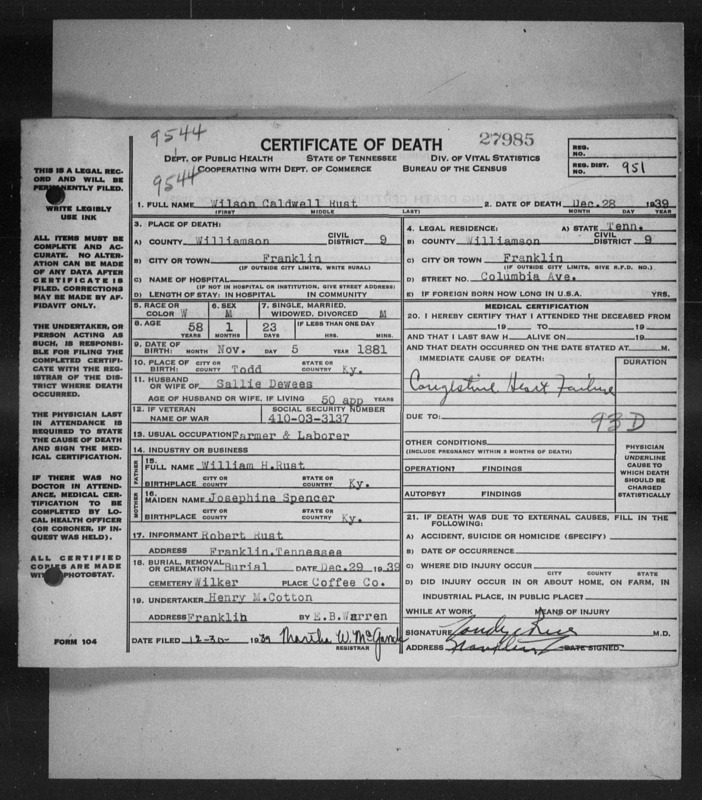 Montrie Lee Deweese, “Tennessee Death Records, 1914-1955,” microfilm, digital folder number: 4183046-image number: 250-film number: 1299650-volume/page/certificate number: v 9 cn 239, https://familysearch.org/pal:/MM9.1.2/M17Y-W5V/p2. 1063. “United States Census: 1930,” Bureau of the Census, US Dept. of Commerce, United States of America, 1930, TN, Sumner, District 14, April 7, 1930, William F Stuggs, 4B, 5, 83-17, T626, 2282, 219, 447. 1064. 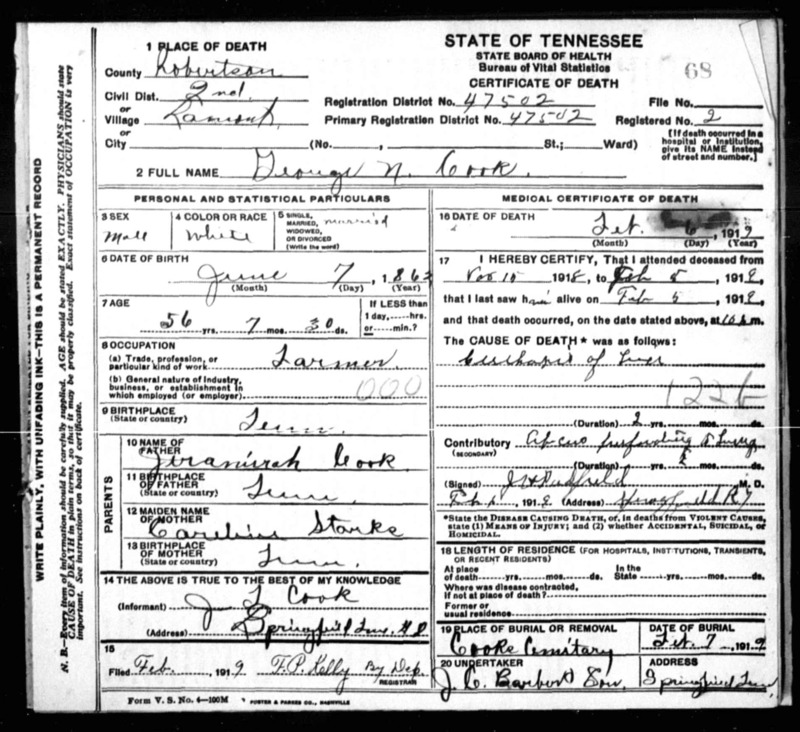 Nathan J Deweese, “Tennessee Death Records, 1914-1955,” microfilm, digital folder number: 4183299-image number: 1777-film number: 1876724-volume/page/certificate number: cn 4261, https://familysearch.org/pal:/MM9.1.2/M1WJ-9P3/p2. 1065. 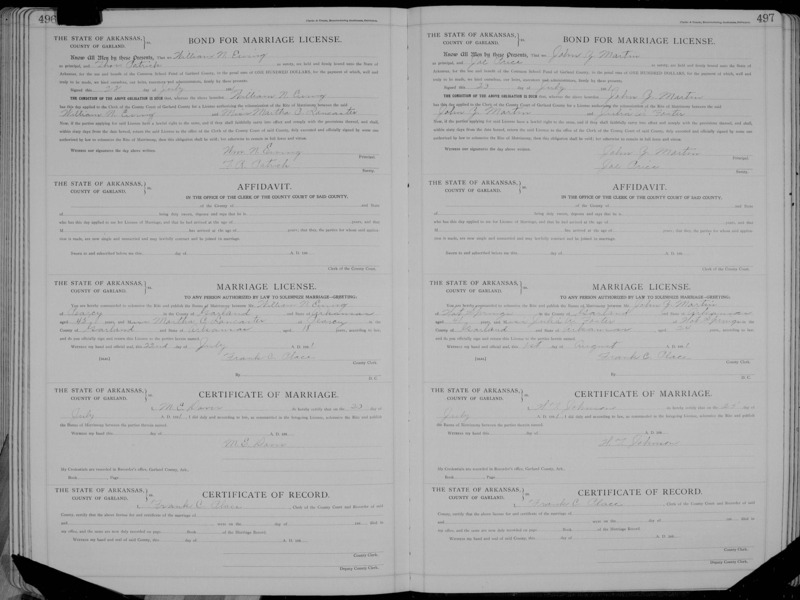 “Tennessee Marriages, 1796-1950,” Spencer Choate and Nancy J. Richardson, microfilm, system origin: Tennessee-EASy-source film number: 979723, https://familysearch.org/pal:/MM9.1.2/M1HT-CBJ/p_10496252638, system origin: Tennessee-ODM-source film number: 979723, https://familysearch.org/pal:/MM9.1.2/M1CF-NP1/p_10501416744. 1066. “California, County Marriages, 1850-1952,” Frederick Spencer Hotchkiss and Emma Simmermacher, page: 53-film number: 1302102-digital folder number: 004640207-image number: 00177, https://familysearch.org/pal:/MM9.1.1/XLD7-Q4J. Groom was 21, bride was 20. 1067. 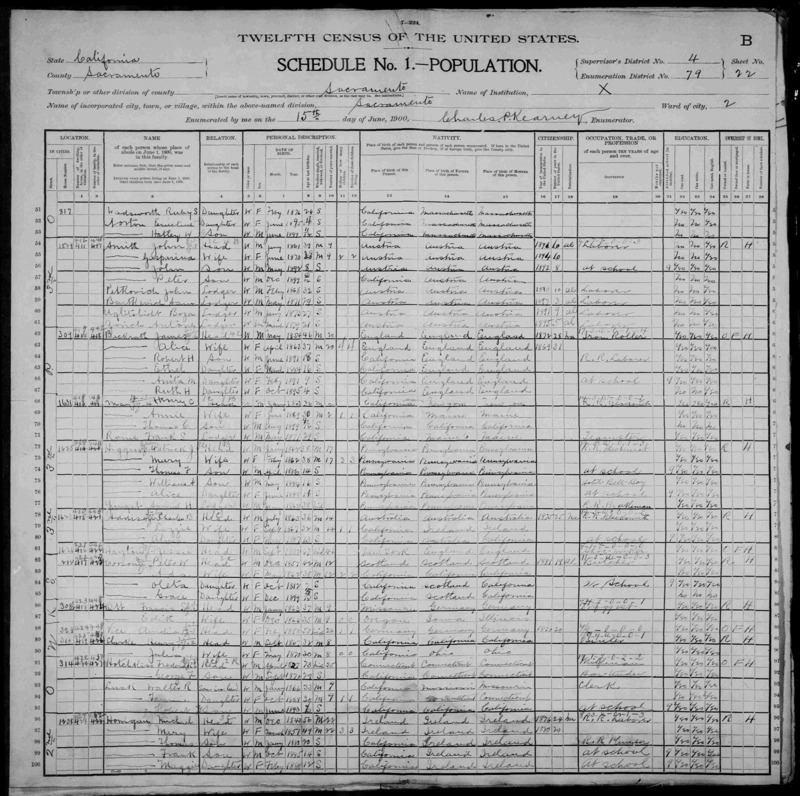 “United States Census: 1900,” Bureau of the Census, US Dept. of Commerce, United States of America, 1900, CA, Sacramento, Sacramento, Ward 2, June 15, 1900, Charles P Kearney, 22B, 4, 79, T623, 98, 175, 360. 1068. Ludwig Friederich Stürm, “Deutschland Geburten und Taufen, 1558-1898,” June 15, 1857, Wittlingen, Baden, Germany, system origin: Germany-EASy-source film number: 1189880-reference number: y 1857 p 101, https://familysearch.org/pal:/MM9.1.1/NCCD-GB9. 1069. “Germany Births and Baptisms, 1558-1898,” Ludwig Friedrich Sturm, system origin: Germany-EASy-source film number: 1189880-reference number: y 1826 p 143, https://familysearch.org/pal:/MM9.1.2/ML24-K7Y/p_12064567110, https://familysearch.org/pal:/MM9.1.2/ML24-LD4/p_11890343310. 1070. 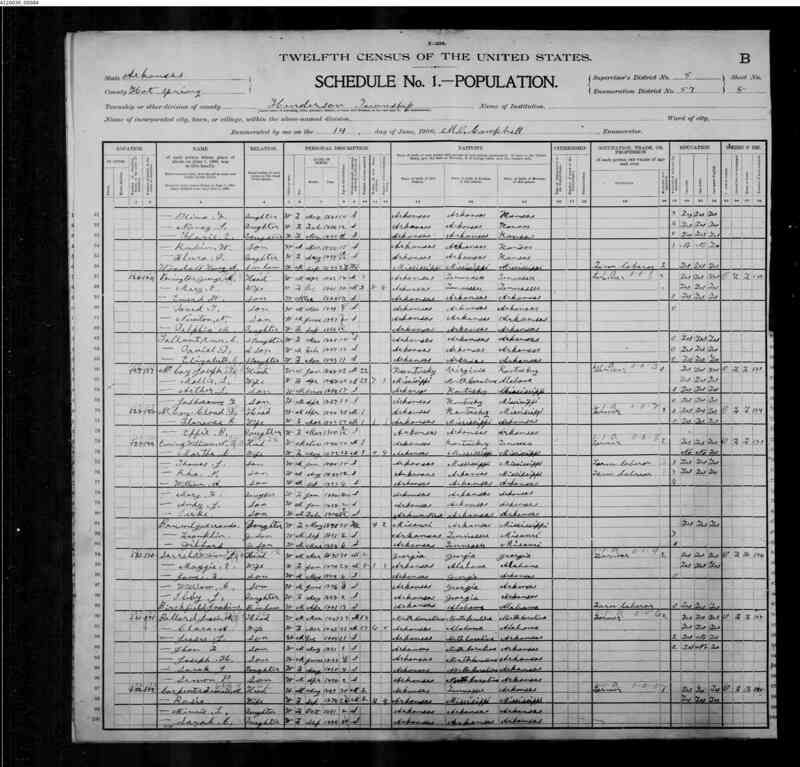 Frieda Bammerlin, “Germany Births and Baptisms, 1558-1898,” system origin: Germany-EASy-source film number: 1189880-reference number: p151, https://familysearch.org/ark:/61903/1:1:NCCD-GP8. 1071. “Germany Births and Baptisms, 1558-1898,” Karl Friedrich Bammerlin, system origin: Germany-EASy-source film number: 1189880-reference number: p 50, https://familysearch.org/pal:/MM9.1.2/ML24-K3W/p_11890336264. 1072. 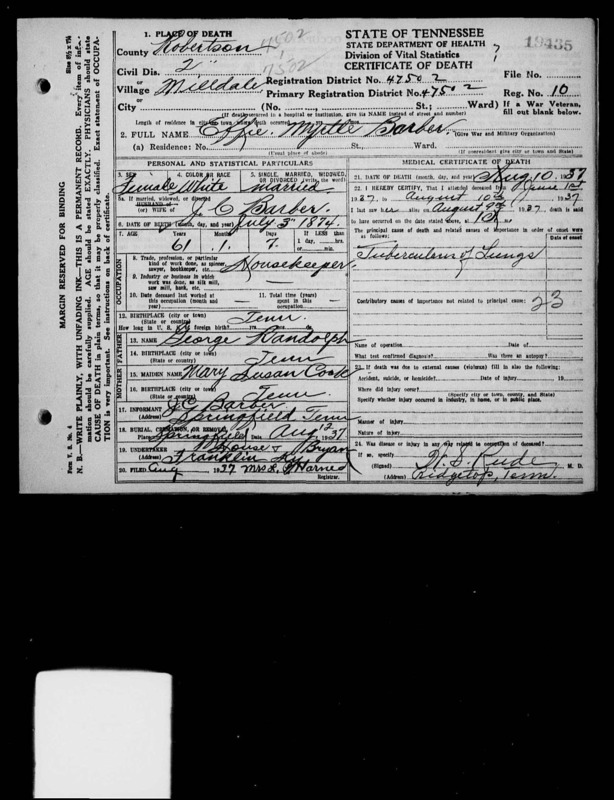 “Germany Births and Baptisms, 1558-1898,” Fritz Bammerlin, system origin: Germany-EASy-source film number: 1189880-reference number: y 1861 p 123, https://familysearch.org/pal:/MM9.1.2/ML24-L2L/p_11890343918. 1073. “United States Census: 1930,” Bureau of the Census, US Dept. of Commerce, United States of America, 1930, CA, Sacramento, Sacramento, District 15, April 17, 1930, Eugene O Irving, 15B, 3, 34-99, T626, 187, 153, 312. 1074. “United States Census: 1920,” Bureau of the Census, US Dept. of Commerce, United States of America, 1920, CA, Sacramento, Sacramento, Precinct 20 1/2, January 2, 1920, Elizabeth M Huab, 2B, 3, 101, T625, 127, 92. 1075. 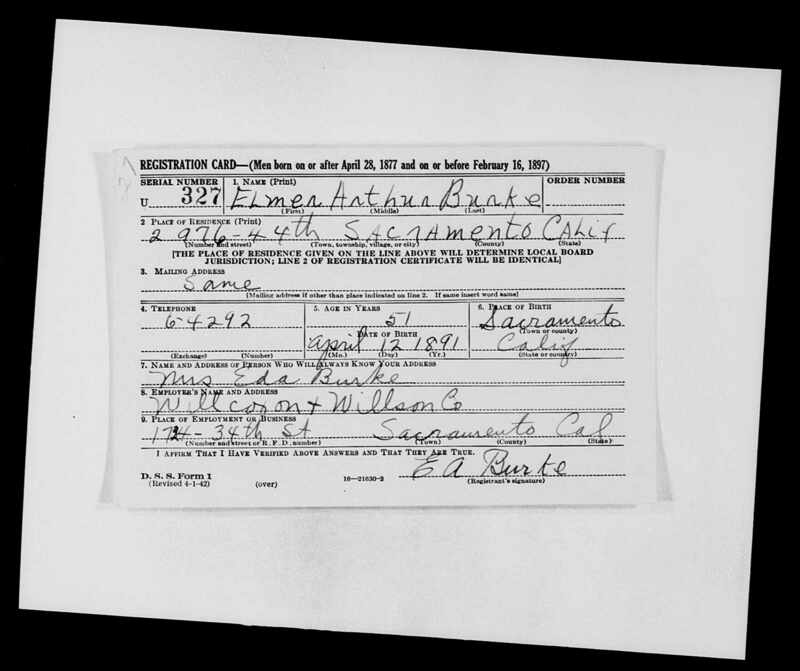 World War II, 1942, California, U327, Burke, Elmer Arthur, “World War II Draft Registration Cards,” April 25, 1942, Sacramento, CA, https://familysearch.org/pal:/MM9.3.1/TH-1-16305-112813-98?cc=1861144. 1076. 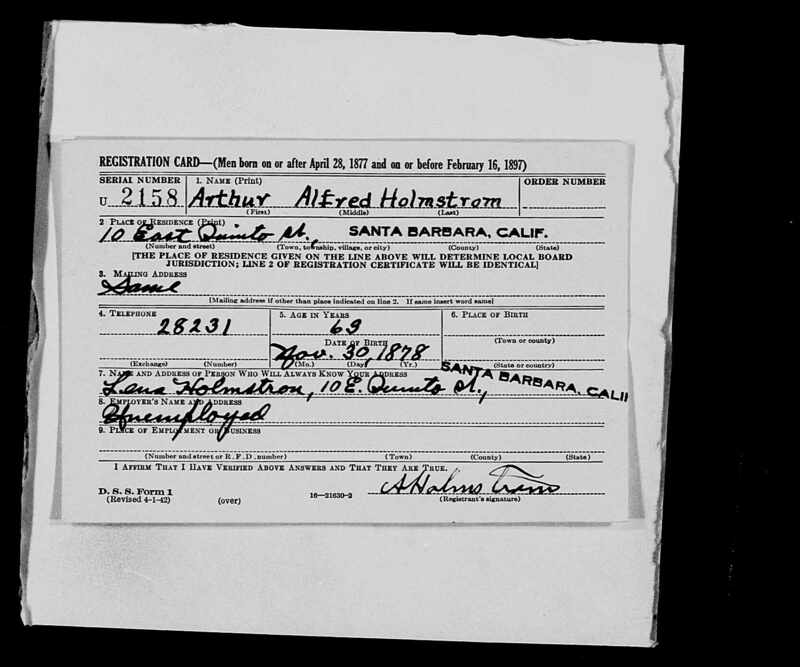 World War II, 1942, California, U2158, Holmstrom, Arthur Alfred, “World War II Draft Cards (4th Registration) for the State of California,” April 25, 1042, Santa Barbara County, CA, https://familysearch.org/pal:/MM9.1.1/V48G-YXT. 1077. “Denmark Baptisms, 1618-1923,” Ole Mikael Christiansen, system origin: Denmark-ODM-source film number: 300753, https://familysearch.org/pal:/MM9.1.2/9CTW-VYR/p1. 1078. Jens Christiansen and Bodil Kirstine Madsen, “Denmark Marriages, 1635-1916,” May 9, 1874, Krummerup, Soro, Denmark, system origin: Denmark-ODM-source film number: 300753, https://familysearch.org/pal:/MM9.1.1/FKCV-1BW. 1079. “Denmark Baptisms, 1618-1923,” Unnamed Christensen, system origin: Denmark-ODM-source film number: 52405, https://familysearch.org/pal:/MM9.1.2/9CT4-2LX/p2. 1080. “Denmark Baptisms, 1618-1923,” Bodil Kristine Madsen, system origin: Denmark-ODM-source film number: 52756, https://familysearch.org/pal:/MM9.1.1/XBZ8-775. 1081. Johan Olsen Opsahl and Ingeborg Ween, “Norway Marriages, 1660-1926,” system origin: Norway-EASy-source film number: 1282535-reference number: bk 2 pg 407, https://familysearch.org/ark:/61903/1:1:N7PZ-VSZ. 1082. 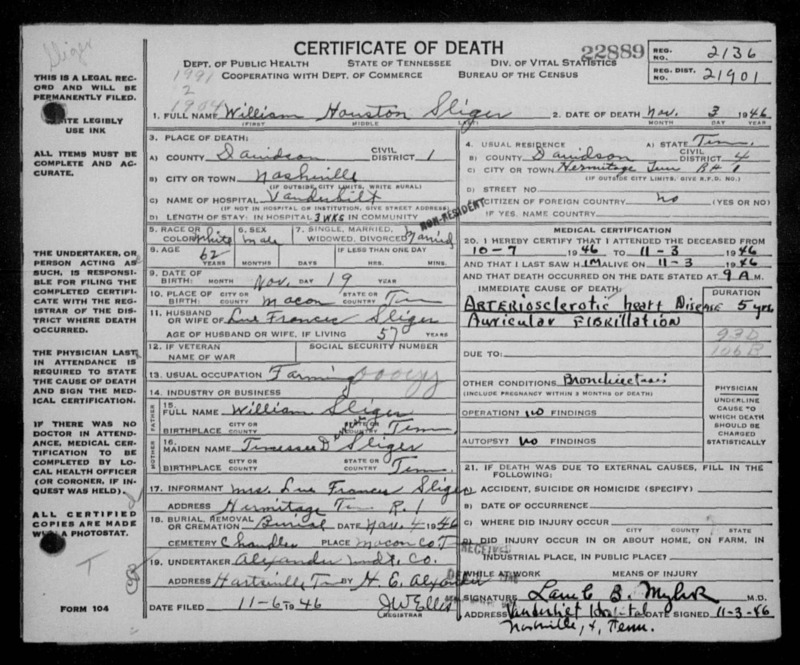 William Houston Sliger, “Tennessee Death Records, 1914-1955,” microfilm, digital folder number: 4184916-image number: 447-film number: 2137376-volume/page/certificate number: cn 22889, https://familysearch.org/pal:/MM9.1.2/M14H-9F8/p3. 1083. 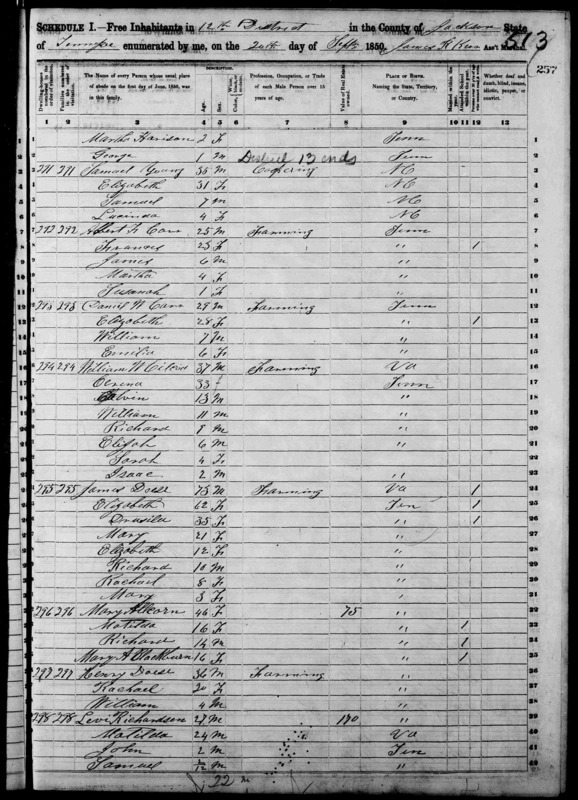 “Tennessee Marriages, 1796-1950,” James Dewees and Elizabeth McCullah, microfilm, system origin: Tennessee-EASy-source film number: 968301, https://familysearch.org/pal:/MM9.1.2/M1HP-FGP/p_10495620436. 1084. “United States Census,” 1850, TN, Jackson, District 12, M432, 885, 257, Bureau of the Census, US Dept. of Commerce, United States of America, September 20, 1850, James R Kerr. 1085. 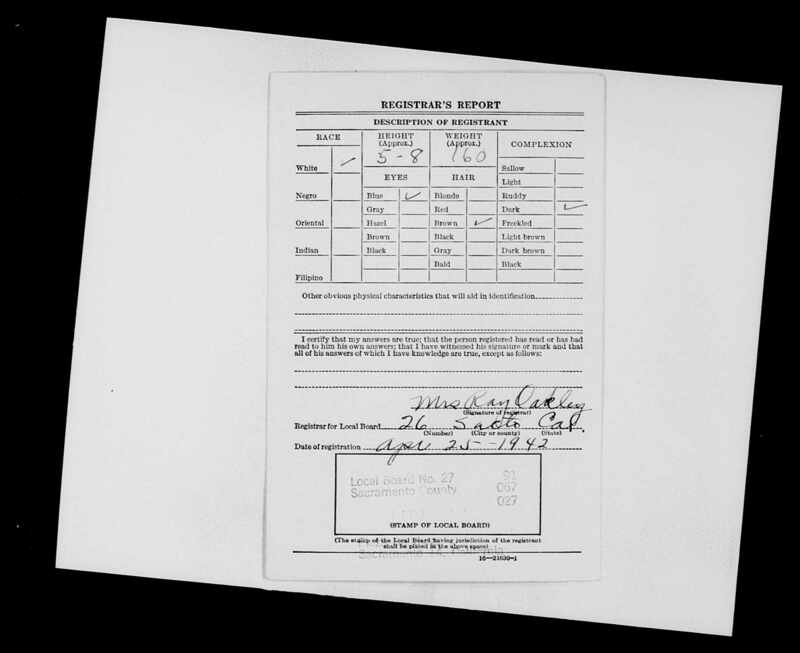 Effie Myrtle Barber, “Tennessee Death Records, 1914-1955,” microfilm, digital folder number: 4183419-image number: 1961-film number: 1876853-volume/page/certificate number: cn 19435, https://familysearch.org/pal:/MM9.1.2/M1WB-JD9/p1. 1086. 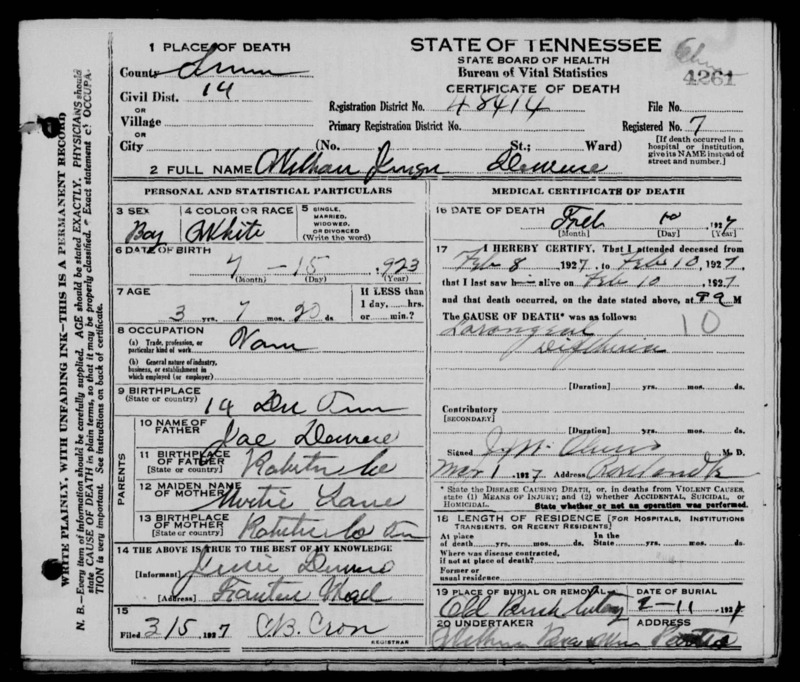 Joseph Culberson Barber, “Tennessee Death Records, 1914-1955,” microfilm, digital folder number: 4184535-image number: 367-film number: 2218308-volume/page/certificate number: cn 49 08303, https://familysearch.org/pal:/MM9.1.2/M14Z-2K7/p1. 1087. 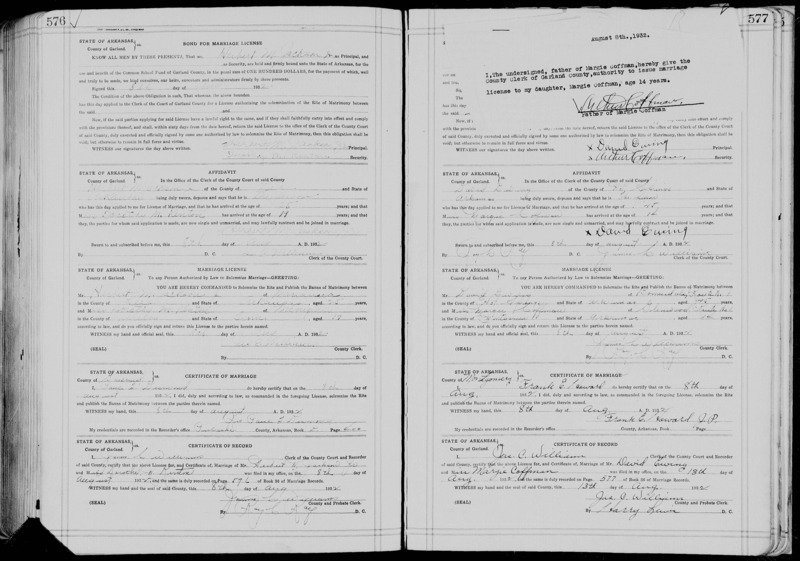 George N Cook, “Tennessee Death Records, 1914-1955,” microfilm, digital folder number: 4183652-image number: 2017-film number: 1299707-volume/page/certificate number: v 43 cn 68, https://familysearch.org/pal:/MM9.1.2/M1W9-KVF/p1. 1088. 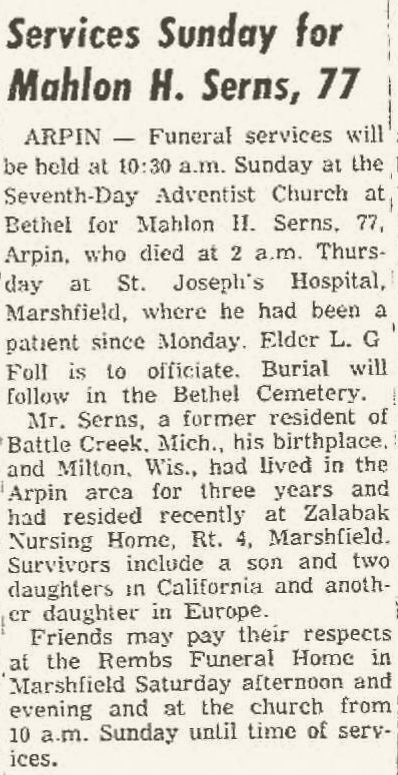 “Services Sunday for Mahlon H. Serns, 77,” Wisconsin Rapids Daily Tribune, Wisconsin Rapids, WI, June 14, 1957, 9. Arpin--Funeral services will be held at 10:30 a.m. Sunday at the Seventh-Day Adventist Church at Bethel for Mahlon H. Serns, 77, Arpin, who died at 2 a.m. Thursday at St. Joseph’s Hospital, Marshfield, where he had been a patient since Monday. Elder L. G. Foll is to officiate. Burial will follow in the Bethel Cemetery. Mr. Serns, a former resident of Battle Creek, Mich., his birthplace, and Milton, Wis., had lived in the Arpin area for three years and had resided recently at Zalabak Nursing Home, Rt. 4, Marshfield. Survivors include a son and two daughters in California and another daughter in Europe. Friends may pay their respects at the Rembs Funeral Home in Marshfield Saturday afternoon and evening and at the church from 10 a.m. Sunday until time of services. 1090. 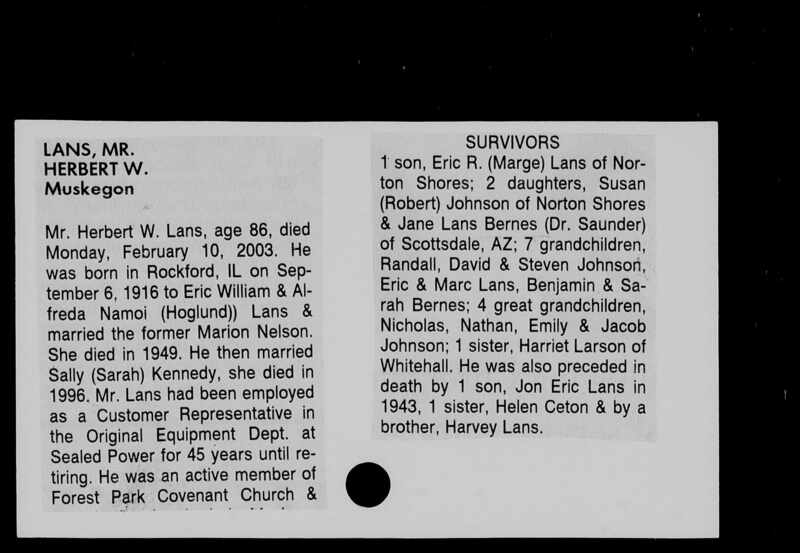 Herbert W Lans, “Michigan Obituaries, 1820-2006,” GS Film Number: 007595645 , Digital Folder Number: 007595645 , Image Number: 00076, https://familysearch.org/ark:/61903/1:1:QVPK-57FV. Mr. Herbert W. Lans, age 86, died Monday, February 10, 2003. He was born in Rockford, IL on September 6, 1916 to Eric William & Alfreda Namoi (Hoglund)) Lans & married the former Marion Nelson. She died in 1949. He then married Sally (Sarah) Kennedy, she died in 1996. Mr. Lans had been employed as a Customer Representative in the Original Equipment Dept. at Sealed Power for 45 years until retiring. He was an active member of Forest Park Covenant Church & sang in the church choir. Mr. Lans enjoyed outdoor activities & was an accomplished artist in oil & water painting. Johnson; 1 sister, Harriet Larson of Whitehall, MI. He was also preceded in death by 1 son, Jon Eric Lans in 1943, 1 sister, Helen Ceton & by a brother, Harvey Lans. Thursday, February 13, 2003, 1:00 PM at Forest Park Covenant Church with Rev. Russell Carlson & Rev. Paul Bengtson officiating. Interment in Oakwood Cemetery. Wednesday, 2-4 & 7-9 PM at Clock Funeral Home. MEMORIAL: Forest Park Covenant Church Memorial Fund. 1091. “Helen E. Ceton,” Find-A-Grave, https://www.findagrave.com/memorial/33086684. 1093. “Obituaries,” Patricia L. "Pat" Simmonds, Salina Journal, Salina, Kansas, October 2, 2009, http://www.saljournal.com/obituaries/story/simmonds100209. LOVELAND, Colo. -- Patricia L. "Pat" Simmonds, 75, of Loveland, died Tuesday, Sept. 29, 2009, at Pathways Hospice. Pat was born Feb. 25, 1934, in Courtland, Kan., the youngest child of Melvin and Fern (Sjolander) Kellogg. She graduated from Phillipsburg, Kan., in 1952. Pat married, and four children were born to that union. In 1960, Pat and her children moved to Goodland, Kan., where she worked as a fry cook at Ray's Cafe. She also was a Den Mother of Cub Scouts as well as a Sunday School teacher. She moved to Loveland in 1978 when she started working at Hewlett-Packard and worked there for 20 years until retiring in October 1999. Pat loved eating with her friends, the "Wednesday Lunch Bunch." She also loved to read, work the crossword puzzles in the paper, and spend time with family and friends. She is survived by her sister, Marilyn Minker, of Gaylord, Kan.; son, Kelly Gene Simmonds, of McDonald, Kan.; daughters, Patricia Sue Simmonds, of Gaylord, and Penny Stiverson, of Denver; grandchildren, Tara, John and Kelly Ray; great-grandchildren, Kyler and Kira; and several nieces and nephews. She was preceded in death by her parents; both brothers; and son, Danny Kaye. Viewing will be from 1 to 4 p.m. Sunday at Viegut Funeral Home, 1616 N. Lincoln Ave., Loveland 80538. Funeral services will be at 11 a.m. Monday, Oct. 5, at the funeral home. Reception following services at Viegut Reception Center. Burial will be at 1 p.m. Thursday, Oct. 8, in Courtland Cemetery, Courtland. Memorials may be given to Pathways Hospice or Leukemia-Lymphoma Society, in care of the funeral home. For condolences, go to www.viegutfuneralhome.com. 1094. “Obituaries,” Blanche Erickson, The Topeka Capital-Journal, Topeka, Kansas, January 4, 2001, http://findarticles.com/p/articles/mi_qn4179/is_20010104/ai_n11762203/. BELLEVILE -- Blanche Erickson, 88, Belleville, died Sunday, Dec. 31, 2001, at a Belleville health care center. Mrs. Erickson was born Aug. 24, 1912, in Courtland, the daughter of Claude and Lydia Pederson Davidson. She was a member of Amana Lutheran Church in Scandia. She married LaVerne "Hank" Sjolander in 1932. He preceded her in death in 1940. She married Carl Erickson in 1948. He preceded her in death in 1993. Survivors include two sons, Marion Sjolander, Malvern, Ark., and William C. Erickson, Hot Springs, Ark. ; seven grandchildren; seven great-grandchildren. Services will be at 10:30 a.m. today at Amana Lutheran Church in Scandia. Burial will be in Courtland Cemetery in Courtland. Bachelor-Faulkner-Dart-Surber Funeral Home in Scandia is in charge of arrangements. 1095. “Obituary,” Fern Vivian Kellogg, Salina Journal, Salina, Kansas, March 1, 2008, http://www.salina.com/news/story/obits022908. SMITH CENTER -- Fern Vivian Kellogg, 99, died Thursday, Feb. 28, 2008, at Smith County Hospital. She was born March 5, 1908, in Republic County to John and Eva (Hoaglund) Sjolander. She was a housewife. Survivors: daughters, Marilyn Minkler of Gaylord and Pat Simmonds of Loveland, Colo.; 16 grandchildren; 28 great-grandchildren; and 15 great-great-grandchildren. Funeral will be at 10 a.m. Monday at Christian Church, Smith Center. Burial will follow in Courtland City Cemetery. Visitation will be from 3 to 8 p.m. Sunday at Simmons-Rentschler Mortuary, Smith Center. Memorials: Gaylord Community Church or Christian Church of Smith Center, in care of the mortuary. 1096. 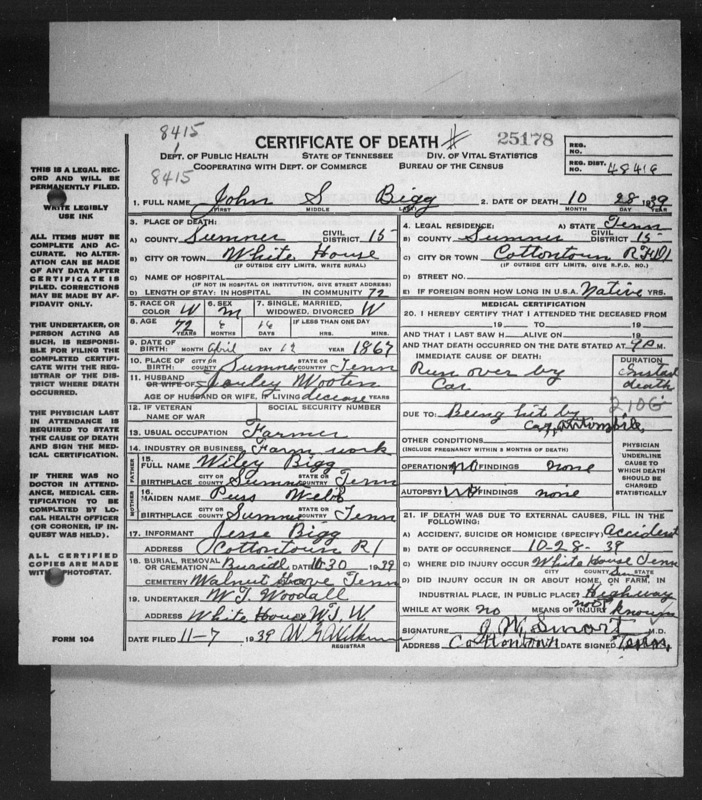 John S Biggs, “Tennessee Death Records, 1914-1955,” microfilm, digital folder number: 4183677-image number: 205-film number: 1876881-volume/page/certificate number: cn 25178, https://familysearch.org/pal:/MM9.1.1/NSSS-ZVQ. 1097. “Arkansas County Marriages, 1837-1957,” David Ewing and Margie Coffman, microfilm, film number: 1927427-digital folder number: 4331455-image number: 00479-page number: 577-source: Arkansas County Marriage Records, 1837-1957, https://familysearch.org/pal:/MM9.1.1/NMYJ-N4X. 1099. “Arkansas County Marriages, 1837-1957,” William N Ewing and Martha C Lancaster, microfilm, film number: 1012706-digital folder number: 4331409-image number: 00296-page number: 496-source: Arkansas County Marriage Records, 1837-1957, https://familysearch.org/pal:/MM9.1.1/NMBQ-WLQ. 1100. “United States Census: 1900,” Bureau of the Census, US Dept. of Commerce, United States of America, 1900, AR, Hot Spring, Henderson Township, June 14, 1900, M O Campbell, 8B, 5, 57, T623, 84.